When using various anti climb products and devices it is a statutory requirement to display appropriate warning signs. It also makes sense to present warning signs as these reinforce the anti climb deterrence. Anti climb warning signs should ideally tell people what type of anti climb precaution is in place. 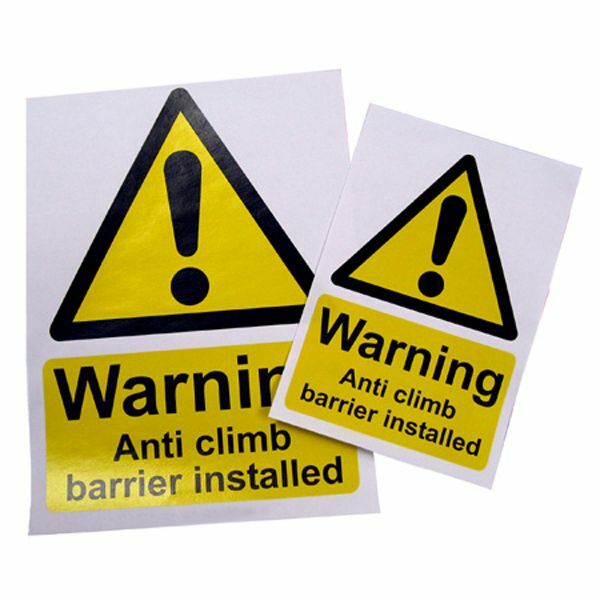 These anti climb barrier warning signs simply tell people: Anti Climb Barrier Installed. This makes them ideal for various forms of anti climb barrier including roller barrier and rotating anti climb spiked spinners. It should be remembered that failing to presentappropriate warning signs could result in civil action if someone is injured or damage occurs due to the anti climb barrier protection. 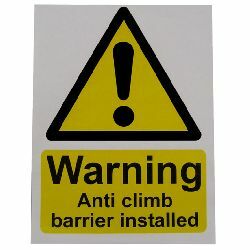 It is important to ensure that warning signs for anti climb barriers are displayed so that they are easily seen by people approaching the protected boundary. For long, linear boundaries - such as fences or walls - it is recommended that warning signs are presented at regular intervals, no greater than 3 metres. These signs are ideal for use with Roller Barrier installations.